What do I need for Discus? If you want to get started with Discus, here are some of the things you\'ll need on your shopping list. Discus reach 15cm/6” and need a 60cm/24” tall tank. They do well in groups of five or more. Go for a tank of 120 x 60 x 45cm/48 x 24 x 18” or bigger. You’ll benefit from adding additional filtration. Expect to pay £600 for the basic kit. Unless you have soft water, you’ll need RO. These units are now so cheap that it makes more sense to buy one, rather than buying water from the shop. Remineralise the soft water with electrolytes before using. Expect to pay less than £100 for a three-stage RO unit. Ammonia, nitrite, pH and nitrate are essential test kits. A pH meter would be handy, as would a Total Dissolved Solids (TDS) meter for checking RO mixes.Expect to pay around £25-30 for the four test kits, £50 for a pH meter and £30 for a TDS meter. 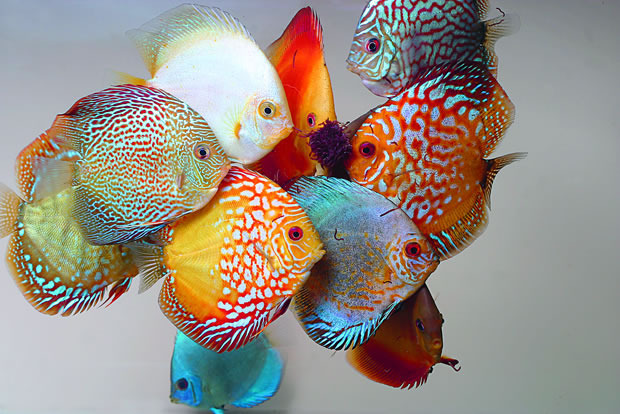 Feed a combination of dry, staple Discus foods like granules and frozen foods like bloodworm. Frozen foods can be enriched with vitamin sprays. Expect to pay £10 for Discus granules and from £2 per pack for frozen foods. Buy five or more of the same size and from the same supplier. Match your water parameters and temperature to those of the dealers for seamless transition. Keep on their own or with small, peaceful softwater fish. Expect to pay from £10-50 or more, depending on size and quality.